The Hallerbos (Dutch for Forest of Halle) is a public forest in Belgium, mostly situated in the municipality of Halle, in Flemish Brabant. It is located about 15 Kms south of Brussels. The forest is a beautiful place for a walk at any time of the year, but for a few weeks in spring, it is something very special. 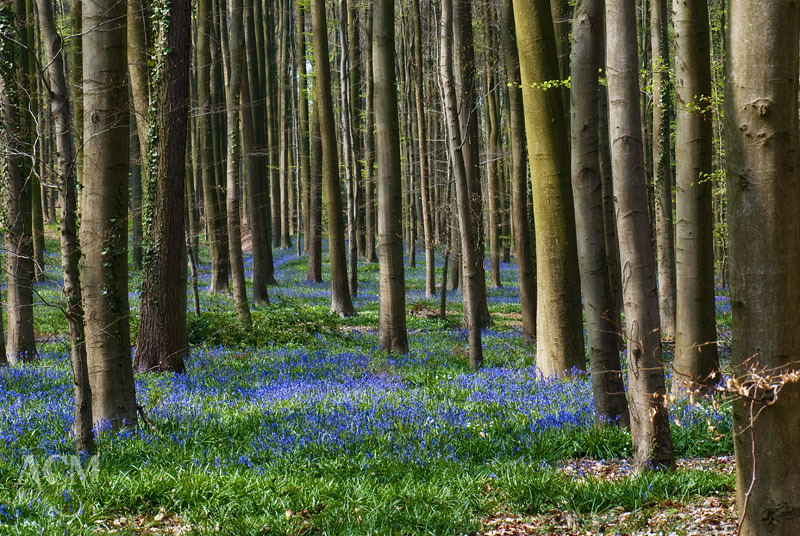 Hallerbos, also known as The Blue Forest, is carpeted with a sea of blue flowers. The Common Bluebell (Hyacinthoides non-scripta) is a spring-flowering bulbous perennial plant with flowers shaped like tiny bells. They thrive under the beech trees of the Hallerbos in late April. Photographing the Hallerbos can be challenging. First, you must get your timing right. If you visit too early in the season, the bluebells will be sparse. If you visit too late, the flowers will be spent and the forest returned to a typical woodland. As the season changes every year, depending on the weather, it can take several visits to the Hallerbos before you see the blue carpet it all its glory. The second challenge is the fact that everyone wants to visit the Hallerbos at this time of year. Having tourists and other photographers in your photo can detract from the scene (for tips on avoiding this problem, see my article on photographing gardens). The Hallerbos is a busy park at the best of times. There are trails not only for walkers, but also for cycling and horseback riding as well. As with all outdoor photography, the best light occurs in Hallerbos early and late. With patience you can achieve lovely lighting filtering through the leaves of the trees. If you are looking to photograph macro images of the bluebells, you can take advantage of the fact that Belgium is often overcast for a nice even light. Whether you visit the Hallerbos with your camera or just your walking shoes, it is well worth a visit in the springtime to see this magical event. This entry was posted on Wednesday, May 13th, 2009 at 05:00 and is filed under Belgium, Garden, Travel and tagged with Belgium, blue, bluebell, forest, Halle, Hallerbos, location, photo, photography. You can follow any responses to this entry through the RSS 2.0 feed.